Wirtgen - a specialist for cold milling, concrete paving, cold recycling and soil stabilization - presented a cross-section of its comprehensive range of solutions for road construction and rehabilitation. The highlight was the world premiere of the W 150 CFi with its new 1800-mm milling drum assembly. The compact milling machine packs a punch with its immense engine power paired with the application-optimized machine transport weight. To perform milling operations as economically as possible, cold milling machines must be transported quickly from one site to the next - especially when the machines are as flexible in their range of applications as the W 150 CFi with its 298-kW engine. The 1800-mm milling drum assembly gives the customers the benefit of a wider range of applications while the cold milling machine hits the mark with increased productivity and area output. In the field of cold recycling technology, Wirtgen presented its WR 240i wheeled recycler as well as its ancillary equipment: the WLV 1 laboratory compactor, the WLB 10 S laboratory-scale foamed bitumen plant and the WLM 30 laboratory-scale twin-shaft compulsory mixer. To determine the quality of the paving results in advance, extensive investigations of the entire road surfacing and a detailed suitability test of the paving mix are required before paving begins. The ancillary equipment was specifically designed for this purpose and allows a 1:1 simulation of the cold recycling process in the road construction laboratory. 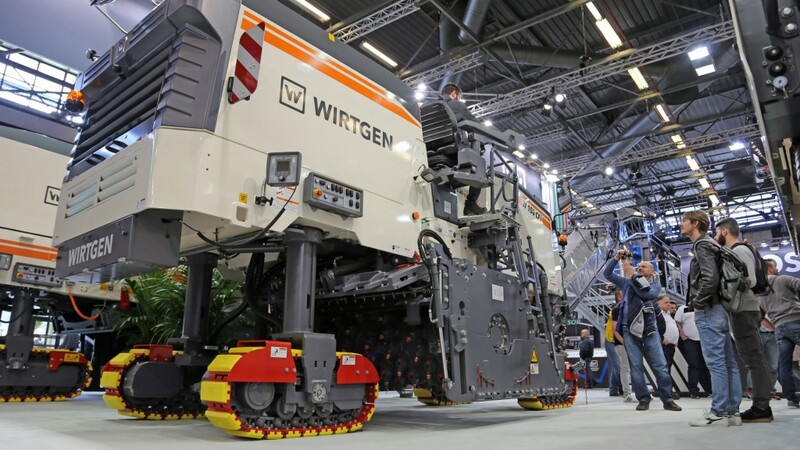 The Wirtgen solutions were rounded off with an on-site presentation of soil stabilization technologies in the form of the WS 250 tractor-towed stabilizer. Thanks to the milling drum assembly's practical attachment system, tractors can be effortlessly converted into soil stabilizers using the WS 250. This combination makes such applications as the homogenization of non-uniform soil mixtures possible. Even heavy, coarse-grained or sandy substrates are reliably transformed by the tractor-towed stabilizers into soil with good paving and compacting properties. Vögele showcased its strengths with the SUPER 800-3i, a success model from the Mini Class series for paving widths of up to3.50 m. In the Compact Class, the company presented the SUPER 1303-3i wheeled paver, which is mainly used on municipal job sites and, in the Universal Class, the SUPER 1800-3i, tracked paver which also excels in highway construction. The exhibit at the trade show was equipped with a very special innovation: the RoadScan non-contacting temperature-measurement and control system. RoadScan makes an important contribution to the enhancement and documentation of paving quality. A representative of the productive Highway Class, the SUPER 2100-3i, rounded off the range of pavers on show. Vögele also proved that its know-how is not limited to road pavers,presenting its state-of-the-art MT 3000-2i Offset Power Feeder. The material feeder's pivoting conveyor opens up possibilities for paving teams - such as feeding pavers with mix from the side. Another highlight was the presentation of WITOS Paving: The telematics-based process management solution networks, among other things, the asphalt mixing plant, the truck and the paver, and in this way ensures efficient and transparent processes at the job site. As everyone involved receives all the data in real time, they can coordinate the paving process precisely and react quickly to deviations. While not yet available in North America this provided a fascinating look into things to come. Hamm presented a cross-section of its complete product range: Rollers from the compact segment, heavy-duty tandem rollers,pneumatic tire rollers and single-drum compactors for earthmoving. Hamm unveiled the new GRW 280i (max. 28 t) pneumatic tire roller. This roller uses the innovative operating concept Easy Drive system, which ensures intuitive and safe operation. It is also used in the tandem rollers of the DV+ and HD+ series as well as in the single drum compactors of the H series. The new pneumatic roller also stands out due to its flexible, further optimized ballasting concept. Hamm is also showed its HD+ 90iPH tandem roller with its environmentally -friendly and fuel efficient Power Hybrid drive achieving fuel savings of up to 15%. The new mobile jaw crushing plant MOBICAT MC 120 Z PRO from Kleemann celebrated a successful première at the Intermat trade fair. With an hourly output of up to 650 tons,thorough pre screening and the powerful diesel-electric drive, the MC 120 Z PRO is particularly efficient in quarry applications. Two plants in theEVO series characterized by compact dimensions, good transportability andflexibility were also exhibited. The impact crushing plant MR 110 Z EVO2 andthe classifying screening plant MS 952 EVO are suitable for both natural stoneas well as recycling applications. Asphalt mixing plant specialist Benninghoven celebrated the world première of its newly developed, patent-pending alternating chute unit at Intermat. For the new ECO asphalt mixing plant range, Benninghoven has developed a new, more cost-efficient alternative to the skip track. The presented alternating chute unit features a purely mechanical structure which is therefore not subject to malfunctions. A new smart design means that no sensor system, motors, brakes,etc. are required, while worldwide functional reliability is ensured.